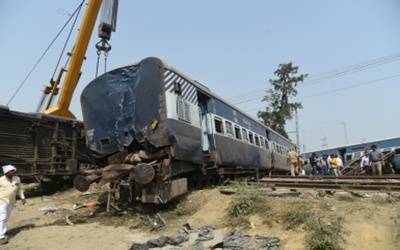 New Delhi, Oct 11 (IANS) The Railways on Thursday suspended two officials, a day after five persons were killed when nine coaches and the engine of a train heading to Delhi from West Bengal derailed in Uttar Pradesh. According to Railway Ministry officials, they were suspended on the recommendation of the Chief Commissioner of Railway Safety after it was indicated that the cause of the accident was prima facie wrong signalling and to ensure that no evidence was tampered with. Northern Railway spokesman Deepak Kumar said: "Senior Section Engineer Vinod Kumar Sharma and Electrical Signal Maintainer Amarnath have been suspended with immediate effect."